IPMS Model Club which meets on the second Thursday of the month. 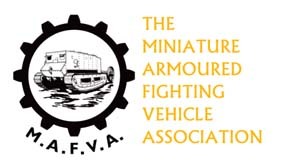 There is a good representation by armour modellers at these meetings, most of whom are MAFVA members. The club displays at local and national shows and hosts its own local “Model Bonanza” model show each January. Activities include visits to and by other model clubs, demonstrations and guest speakers. If any MAFVA members are interested in attending or have any questions about the club please contact Dave Morris at dm001a9698@blueyonder.co.uk. It is stressed that you do not have to be a IPMS member to attend, though an annual club subscription fee is payable. Radio control tank club in Bristol. The Miniature Armour Group would like to welcome new members and visitors to their club. It is an informal group of modellers who build military equipment in all scales, dating from the First World War to the present day. They meet the 1st and 3rd Monday of every month from 7.00pm to 9.30pm. The venue is the Govanhill Neighbourhood Centre, 8 Daisy St, Govanhill, Glasgow. Feel free to pop along on an evening or call Rab Burns on 01877 382 141 for further information. We will also attend the MAFVA Nationals in Cambridge and share the Scottish MAFVA Display Stand there and would like to invite any Scottish MAFVA members to display their models on this stand. Under 14’s accompanied by an adult. A Group for those interested in post World War 2 British Armour. We are a scale model club open to all modellers whatever your level of interest. Whether you build aircraft, armour, trucks, ships, figures, cars or science fiction we would love for you to come and join us. Our aim is to help each other improve our models and enjoy this fascinating hobby. on the 1st Saturday afternoon of each month. See the Club Diary page for confirmed dates. Please drop us a line via the Contact page for more details. Don’t forget you can follow us on Facebook now.